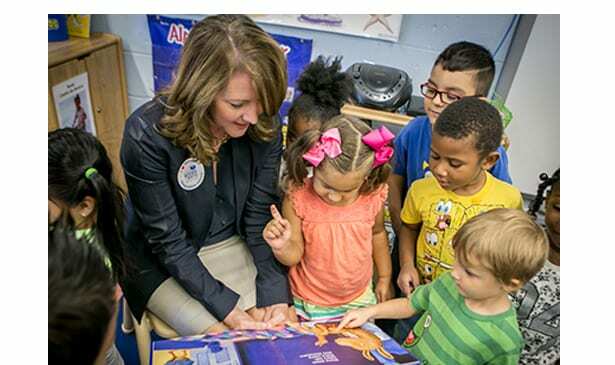 First Lady of Tennessee, Crissy Haslam read a story in the Children’s Gallery. NASHVILLE, TN — There are plenty of things to learn as you walk through the exhibitions at the new Tennessee State Museum on the corner of Rosa L. Parks Blvd. and Jefferson Street. You’ll discover that red pandas once lived in Tennessee. And that our state is the birthplace of some of the most influential music in the world, from the blues echoing out of Beale Street clubs in Memphis to R&B reverberating on Nashville’s Jefferson Street to jazz giants jamming at Knoxville’s Gem Theatre. There are thousands of stories in the Museum, told through artifacts, images, performance costumes and audio-visual media, spread out across six permanent and six temporary exhibitions. And the best part? There is no admission fee. There is no reason to not take continual advantage of the access to the exhibitions and explore all that Tennessee art, music, history and culture has brought to world. In addition to exhibitions, the Museum will also offer a robust calendar of free events for adults and children. In the whimsical new Children’s Gallery, the Museum presents “Storytime” every Thursday at 10 a.m. For children 3 to 6 years old, this recurring event will include a book- reading and craft or other activities. No reservations are required– just bring your family. On Saturday, October 27, one of the Museum’s most popular events is back in the new location. The Haunted Museum and Ghost Story Festival offers chilling ghost stories from Tennessee’s past along with prizes and craft activities. Visitors – that includes children and adults — are invited to wear costumes. A costume parade will begin at noon. The Museum staff will also continue to offer its popular Lunch & Learn Lecture Series, where guests are invited to bring a lunch – eateries along Jefferson Street, in Germantown or at the Farmers’ Market are good options – and enjoy an educational experience. The free series kicks-off appropriately enough on Wednesday, November 14 with “The Myth of Thanksgiving.” Amanda Lee Savage, an instructor of history at the University of Memphis, will give a presentation on the legends and lore surrounding one of America’s favorite holidays. Additional information on these events and more can be found on the Museum’s website at www.tnmuseum.org. We hope to see you there.